Dermal fillers allow men and women to restore volume in their faces while helping to eliminate the appearance of wrinkles and facial lines without the need for surgery. Depending on the particular type of filler and how deeply it is injected, these facial injectables can help smooth out the surface of the skin, fill in deep lines like nasolabial folds (laugh lines), create facial structure, and even augment soft tissue. 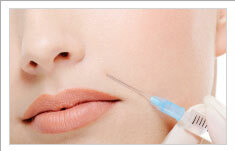 Juvéderm® is a cosmetic dermal filler made of hyaluronic acid. Hyaluronic acid is a natural substance that already exists in the human body and is used to provide volume and fullness. The hyaluronic acid in Juvéderm® is biodegradable and fully biocompatible with human hyaluronic acid. Typically, Dr. Sardo uses Juvéderm® to treat the area around the mouth, including the nasolabial smile lines, lines at the corners of the mouth and along the lip border which gives the lips a fuller appearance and helps minimize wrinkles around the mouth. Juvéderm® lasts about a year. The cost is $550 per syringe. VolumaXC™ is also a hyaluronic acid that has been more tightly crosslinked, allowing it to give firmer support to the tissues. It is used in a deeper plane for revolumizing and enhancing the contours of the cheeks. The volume and subtle lifting effect creates a more youthful profile for up to 2 years. Most will use 1-3 syringes for optimal treatment. The cost is $950 per syringe. Sculptra® is a unique filler used for the subtle, gradual plumping of facial contours. It is made from biocompatible, biodegradable synthetic material that has been used by physicians for decades and is highly trusted. Sculptra® creates subtle results over time, giving you a natural and improved look. Sculptra® is made from poly-L-lactic acid which works to stimulate the production of collagen replacing that lost from aging. Dr. Sardo will typically perform injections in areas such as nasolabial folds (folds between your nose and mouth), around the cheeks, chin, and jawline. Sculptra® may require 1 to 3 (rarely 4-5) treatments (1 vial at a time) for the best results, and Dr. Sardo typically recommends these be scheduled four weeks apart. The cost is $950 per vial. Bellafill® is a long lasting filler comprised of collagen and permanent PMMA microspheres. Unlike other injectables, these unique microspheres are not absorbed by the body and instead work with your skin to produce your own collagen even after the injected collagen base is absorbed. Bellafill® is excellent for nasolabial folds and marionette lines and can also be used on depressed scars. It can last well beyond 5 years. Most patients only require one to two treatments to achieve their desired look. The cost is $950 per syringe. Belotero from Merz Aesthetic is a new Hyaluronic Acid (HA) dermal filler. HA naturally exists as a component of your skin. It attracts and binds water allowing immediate and smooth correction of tiny creases. Belotero is similar to other HA products like Juvederm or Restylane, but it is much softer and better suited for treating finer, more superficial lines and more delicate areas of the face, such as vertical lip lines, crows feet, and neck creases. These areas can be difficult to treat with Juvederm and Restylane. Belotero Balance is designed to integrate into your skin and can be placed close to the surface to inconspicuously soften and reduce fine lines. This product will last 6 or more months. A treatment (one cc syringe) of Belotero is $500. Typically, dermal fillers can be administered in-office in about 30 minutes. Dr. Sardo will clean the treatment areas and may provide a topical anesthetic. Ice compresses are applied to minimize pain and bruising. The fillers contain an anesthetic as well to lessen discomfort when injected. Dr. Sardo will carefully plan the procedure and location of injections. She may adjust your position and lighting during the procedure to assure the best results. Side effects are generally minimal, very well tolerated, lasting less than a week. Immediately following the procedure, you can return to full activity with no limitations. However, you should avoid heat after the treatment. Possible temporary side effects are redness, pain and tenderness, firmness, swelling, bumps, bruising, itching, and discoloration. Bruising may last up to 2-3 weeks. As with any cosmetic procedure, there is a potential risk for infection. Cool compresses after the procedure may help with bruising and swelling. If Sculptra was used you will be asked to massage the treated areas several times a day for 5 days. Dr. Sardo uses several other injectable fillers and also performs fat grafting depending on a patient’s individual needs. Come in for a complimentary consultation for an evaluation to determine how fillers can improve and rejuvenate your appearance.